The Humidifier replenishes moisture to dry air. The Evaporator Coil allows the refrigerant to absorb heat from the air as it passes over the coil surface. 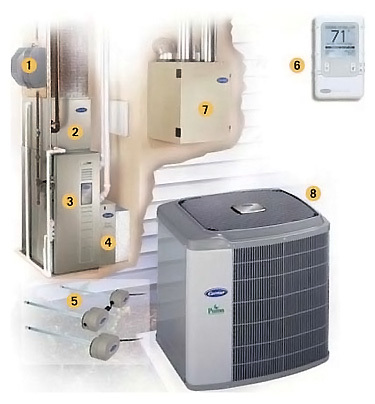 The evaporator coil is located with the indoor unit and is also referred to as the indoor coil. The Furnace provides reliable, high-efficiency heating for long-lasting comfort and energy savings. Available in high-efficiency models for both gas and oil-based fuel sources. The Air Cleaner improves air quality by removing harmful and irritating airborne pollutants from your home. The Ultraviolet Germicidal Lamp reduces the amount of pollutants such as mold, bacteria, fungi and viruses, leaving your home with cleaner, fresher indoor air. The Infinity™ Control is the interface to the Infinity System. The Infinity System is the only system in the industry that allows you to control temperature, humidity, air quality, fan speed and ventilation. The Comfort Ventilator combines fresh outdoor air with conditioned indoor air for improved air quality and maximum efficiency – great for today’s tightly constructed home. The Air Conditioner provides reliable, high-efficiency cooling for long-lasting comfort and energy savings. Ask about environmentally sound Carrier air conditioners with Puron® refrigerant. 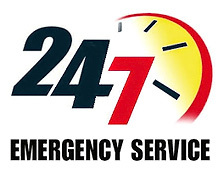 Give Nunning a call today at 812-421-8899 and receive a FREE estimate on all new and replacement HVAC systems!